Why should you learn React ? How do you get started with React? Begin your journey towards becoming a React expert by enrolling in this course, which is based on Version 16. Loaded with a whole new set of features, mastering React 16 has become mandatory for those pursuing a career in frontend development. Our course will serve as a window into the world of React and front end development. The hands-on learning sessions will teach you all about the architecture, components and the advanced concepts involved in building rich internet applications using React.JS, Flux and Redux. You will also master the art of creating and deploying dynamic front end applications using React features like component architecture, data binding, declarative views, universal apps and much more. The curriculum is designed by industry experts in such a way that it is job-oriented and at par with the latest advancements in the field. For hands-on lab setup, below prerequisites must be satisfied. Immersive Hands-on training with combination of theoretical learning, hands-on exercises, group discussions, assignments and intensive Q&A sessions. Ask questions, get clarifications, and engage in discussions with instructors and other participants. Get Mentored by Industry practitioners having more than 10 years of experience. Don’t gain just theoretical or practical knowledge. Understand the WHAT, WHY, and HOW of a subject. Simplify the subject matter and get in-depth comprehension. Get reviews and timely feedback on your assignments and projects from professional developers. We emphasize on learning the concepts through examples and help you in building a portfolio of projects through the course of training. Free lifetime enrolment into any of the upcoming batches to help you refresh the concepts. The Curriculum goes through multiple levels of design and preparation by the experts to keep the topics/modules relevant to everyday changes in technology. Learn to use collaborative mediums to share opinions and improve your coding skills with assistance from the instructors and other participants. Learning Objective: Understand how react makes things perform, learn how to set up, run and debug a react app. Hands-on: Install create-react-app and create a new react project. Learning Objective: Understand the significance of JSX and know its syntax and features. Learning Objective: Understand the significance of component architecture and learn how to decompose UI into components and compose them back to make UI. Hands-on: Create class based and functional components. Learning Objective: Learn how to manage state in class based react components and how to make communication between components using props. Hands-on: Create a stateful component and stateless component. Pass data from parent component to child component using props. Implement child to parent communication using callbacks. Learning Objective: Learn how to render lists and use key prop. Hands-on: Create component which renders lists iteratively using map function of array. Learning Objective: Learn about React's synthetic event system and its working. Hands-on: Handle different synthetic events. Learning Objective: Understand the significance of lifecycle methods and application in real time use cases. Also learn how to handle errors declaratively. Hands-on: Create a stateful component and implement lifecycle methods. Implement try catch mechanism using error boundaries. Learning Objective: Understand how to handle forms in react. Hands-on: Create a component that uses different form controls. Learning Objective: Understand how to work with global state using context API. Learning Objective: Understand the need of code splitting and implement the same on a component basis. Hands-on: Create react application that implements code splitting and lazy load components using React.lazy and suspense features. Learning Objective: Understand the need for hooks and implement hooks to access state and effects hook in functional components. Learning Objective: Understand the significance of routing, configure routing for SPA. Hands-on: Install and setup router, configure routing rules, implement declarative and imperative navigation. Learning Objective: Understand how to manage state in just redux in plain vanilla JS app. Hands-on: Create actions, reducer and store. Dispatch actions and subscribe to store changes. Learning Objective: Understand the challenges of mutability and how immutable.js helps over the mutability challenges. Hands-on: Create immutable List, map and set. Perform CRUD operations. Learning Objective: Understand how to integrate redux into react application. Hands-on: Install and setup react redux. Configure Provider component as top level component. Migrate react stateful component to connected component. Learning Objective: Understand the significance of middleware and learn how saga middleware works. Hands-on: Install and setup logger and saga middleware. Develop sagas use different side effects. Code sagas to fetch data from remote API using fetch/axios. Learning Objective: Understand significance of UI testing and learn how to unit test components, reducers using jest and enzyme. Hands-on: Understand jest configuration. Install and setup enzyme. Write unit test to components and reducers. Learning Objective: Understand the significance of Webpack and learn how to set up a react project from scratch. Hands-on: Install and Setup webpack v4. Create a react boilerplate from scratch. Learning Objective: Understand the significance of isomorphic react and setup SSR. What is server-side rendering (SSR)? Hands-on: Extend the react boilerplate to enable SSR. Develop express JS app to serve SSR powered react app. Use your skills of react, redux and redux saga to build an e-commerce application that sells electronic products online. Use your skills of react, redux and redux saga to build an application that provides details of famous books in multiple genres - a mini project like wikipedia but limited to book details. What will I learn during React training program? What would be the objectives of React JS workshop? The objective of this course is to help you learn the practical aspects of ReactJS and its ecosystem. Through our hands on, practical approach, you will get working knowledge of developing Single Page Apps and creating highly responsive and interactive web pages. By the end of this workshop you will become familiar with the fundamentals of this language at an application level so that you can confidently seek jobs as a developer in this domain. What are the prerequisites for React JS Course? Do I need to have prior knowledge of HTML and CSS for React training? HTML and CSS skill would be required for developing ReactJS Single Page applications. Though react uses JSX, HTML fundamentals are needed and to style react application CSS skills are desired. Who can take up this React JS Course? Why should I learn React JS? How are the workshops conducted? One-to-One Training: You can enrol for one-to-one Node js classroom training session with our expert trainer at a preferred time. With this mode, you can customize your curriculum to suit your learning needs. Team/Corporate Training: In this type of training, an Organization can nominate their entire team for online or classroom training. You can customize your curriculum to suit your learning needs and also get post-training expert’s support to implement Node js concepts in the project. We follow the below mentioned procedure for all the training programs by dividing the complete workshop experience into 3 stages i.e Pre, Workshop and Post. This is a tried and tested approach using which we have been able to upskill thousands of engineers. Study Plans - To structurize your learning. Will there be any labs available during the workshop? Yes, Zeolearn has well-equipped labs with the latest version of hardware and software. We provide Cloudlabs to explore every feature of React through hands-on exercises. Cloudlabs provides an environment that lets you build real-world scenarios and practice from anywhere across the globe. You will have live hands-on coding sessions and will be given practice assignments to work on after the class. At Zeolearn, we have Cloudlabs for all the major categories like Web development, Cloud Computing, and Data Science. How many projects will I create during the React JS training program? You will get to work on 2 live projects during the course of the training. Who are going to be the instructors or mentors? This course is delivered by industry-recognized experts who would be having more than 10 years of real-time experience in React and web development. 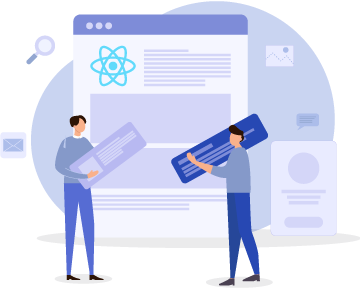 Not only will they impart knowledge of the fundamentals and advanced concepts, they will provide end-to-end mentorship and hands-on training to help you work on real-world projects with regards to React. How do I setup the environment for React JS? Once you register for the course you will be provided with system requirements and lab setup document which contains detailed information to prepare the environment for the React JS. What software/hardware would I need to attend the class? How is Online Interactive training Conducted ? All our training programs are quite interactive and fun to learn with plenty of time spent on lot of hands-on practical training, use case discussions and quizzes. Our instructors also use an extensive set of collaboration tools and techniques which improves your online training experience. Is this live training or pre-recorded videos ? This is a live training which the learners can attend from office, home, or any other suitable place, with a proper internet connection. How do I join the class ? You will receive a registration link to your e-mail id from our training delivery team. You will have to log in from your PC or other devices. Do I have other participants in the class ? Yes, there are other participants who actively participates in the class remotely. They can attend online training from office, home, or any other suitable place. How does the 24/7 support work ? In case of any queries, you can reach out to our 24/7 dedicated support at any of the numbers provided in the link below: http://www.zeolearn.com/contact-us, or send an email to hello@zeolearn.com. We also have Slack workspace for the corporates to discuss the issues. If the query is not resolved by email, we will facilitate a one-on-one discussion session with our trainers. If you miss a class, you can access the class recordings anytime from our LMS. At the beginning of every session, there will be a 10-12 minute recapitulation of the previous class. You can watch the online recording and clarify your doubts at that time. You may need to login 15 minutes before the main lecture begins to avail this facility. We also have a Free Lifetime enrollment for most of our courses. In case you miss out a class, you can also enroll for another complete workshop or only for a particular session. Typically, Zeolearn’s training are exhaustive and the mentors help you out in understanding the in-depth concepts. However, if you find it difficult to cope, you may discontinue within the first 4 hours of training and avail a 100% refund. Learn more about our refund policy here. Is there a money back guarantee for the training programs ? Zeolearn offers a 100% money back guarantee if the candidates withdraw from the course right after the first session. To learn more about the 100% refund policy, visit our refund page. Are there any scholarships available ? Yes, we have scholarships available for Students and Veterans. We do provide grants that can vary upto 50% of the course fees. To avail scholarships, please get in touch with us at hello@zeolearn.com. The team shall send across the forms and instructions to you. Based upon the responses and answers that we receive, the panel of experts take a decision on the Grant. The entire process could take around 7 to 15 days. Can I pay the course fees in installments ? Yes, we do have installment options available for the course fees. To avail installments, please get in touch with us at hello@zeolearn.com. The team shall explain on how the installments work and would provide the timelines for your case. Usually, the installments vary from 2 to 3 but have to be paid before you complete the course. Dallas is one of the major cities in Texas and has historical significance as an economic capital for oil and cotton industries and its location along the USA’s numerous rail road lines. There is a bustling recreational scene here with many parks and galleries and Dallas is also home to many colleges and universities. Retail and real estate are two main drivers of its economy and Dallas has offices of several large companies in its famous business district. As you embark on your React.JS Online Course in Dallas, the first few lectures will focus on ES6 basics which include valuable lessons on Enhanced Object Literals and Comprehensions. As participants gain more familiarity with the basics of the React.JS Course in Dallas, the next step on the course agenda is building UIs with React.JS. This segment of the course includes comprehensive lessons and exercises on topics like models, components, react links, forms, best practices and other UI aspects like animations and performance helpers. While you are part of the React.JS Training in Dallas, you will be introduced to the various aspects of Flux and Redux architecture, from the basics to architectural components like reducers and dispatchers. As the React.JS Training Classes in Dallas draws to a close, your trainer will teach you about Webpack, including important topics like module bundling, configuring automatic browser refresh and hot loading components. The Zeolearn institute course is available at a low cost. We take all feedback seriously and if you’re not happy with our methods of coaching, Zeolearn will refund your entire course fee after the first demo session. Familiarity with building user interfaces and web applications using React.js. If you are a web developer looking to build high quality web UIs, then the React.JS Certification in Dallas is the course for you. With our guidelines for exam preparation combined with your efforts, we are sure that you will pass the PMP� certification exam or we will reimburse you the class cost. The 1st Exam must be taken within 45 days of the PMP� 35 PDUs training class. We guarantee you will pass the certification exam or we will reimburse you for the class cost. If you do not pass the exam in three attempts (details described below), we will pay you back for the class cost. 1st Exam must be taken within 45 days of the PMP® 35 PDUs training class. If unsuccessful on 1st exam, you may retake our KnowledgeHut class (for free) as many times as you like. If unsuccessful on 2nd exam, you MUST retake our KnowledgeHut class (for free) before taking exam for the 3rd time. 3rd Exam must be taken within 30 days of the retaken class.